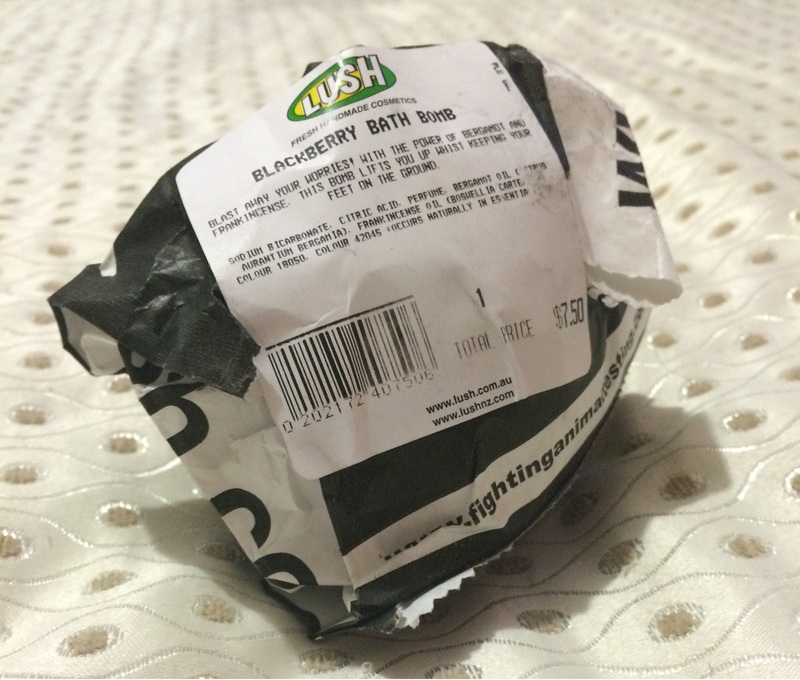 Yep, it’s another Lush bath bomb review! I got a couple of bombs last week and decided to use my Blackberry one first. I’ve waxed lyrical about Lush products a number of times before, so let’s jump straight in, shall we? The Blackberry bomb is one of Lush’s oldest, created waaaay back in 1989! This bomb is older than me! Its most obvious scent is, of course, blackberries, but it also has hints of bergamot and frankincense. It’s a simple formula, but it’s one that works and works well, which has made it go down as one of Lush’s most popular bombs to date. It has a gorgeous pale purple colour with BOMB cut into the front, and it’s gratifyingly large. I love me some melts, but they just don’t go the distance like these bombs do. I think that you could easily cut this in half to stretch it to two baths, and possibly even three! 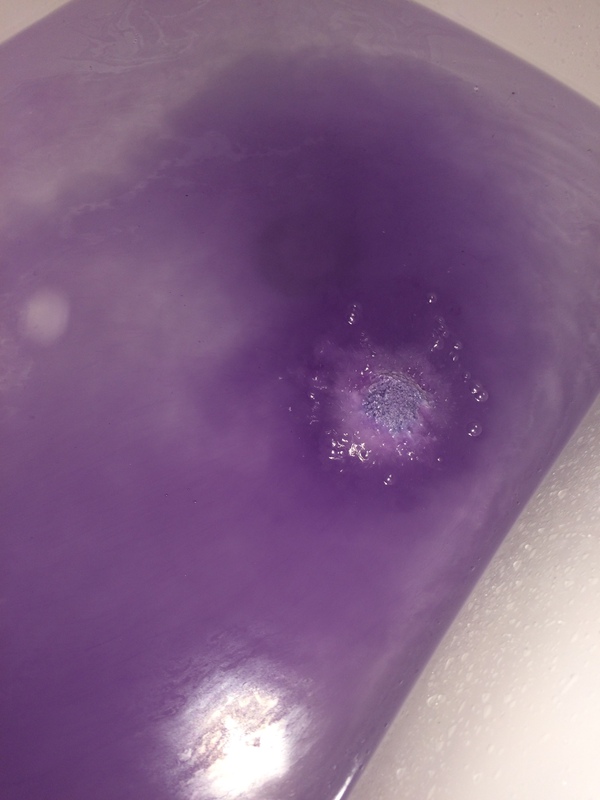 So the bomb obviously turned my water purple. A lovely dark purple! I didn’t get any photos of the completed water as I totally forgot, but it didn’t change colour from the above pictures. The bath smelt wonderful, the water was soft and silky, it was just heaven. But then I got out of the bath and drained the water. I had the biggest, most purple ring right around my bathtub. Splashes of water had stained the top of the bath and the floor. My skin wasn’t purple, but I reckon if I had been in there much longer I would have been! It took rubber gloves, cleaning agent, and a scrub brush to get the purple off, and that’s not the most relaxing activity to do after a soak. And then my skin started itching. Even with moisturiser, my skin was red, itchy, flaky, and downright maddening. I’m not sure what was in this bomb that irritated me so much, as it’s got a very small ingredients list, so perhaps it was the quantities of the oils, or the fragrance. Whatever it was, ouch! So I was disappointed by this bomb. 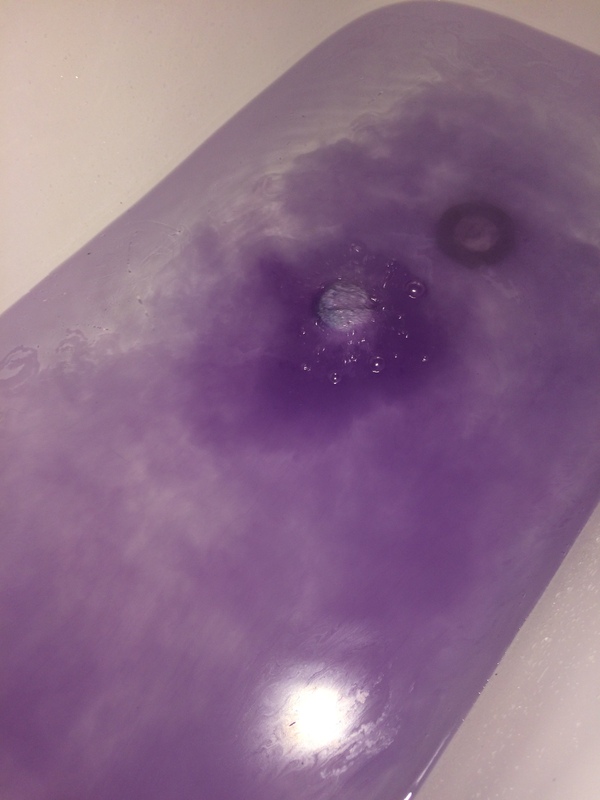 It’s pretty, it smells gorgeous, but in the end it just left me itchy and my bathroom purple. Oh, and it had a ‘BANG’ sticker in the middle of it, which freaked me out because I thought there was a plaster in the bath! Has anyone else used this bomb? Have you had a reaction to it, or did it work out well for you? Let me know in the comments!